I had to endure periodic assaults. Each time I returned home crying, sobbing or bruised my mother would offer me two choices only. First, she would advise me to play by myself in the safety of our home. Second, she would warn me that if I went out to play with the bullies, I better return home quiet with no complaints or I would have to face her punishment for not knowing how to defend myself, and insisting on putting myself in harm’s way. As I grew, I set up a makeshift gym, with weights made out of tin cans and cement, and quietly began a process of acquiring muscles and physical strength to defend myself and my right to express my ideas. I came to understand the social context of obscurantism and poverty. I also learnt about the political establishment that did not want individuals to stand out except in obedience to its rules and dogmas, and the mediocrity that became the norm of social being. Yet, I was deeply affected by the experience. I had to learn to be invisible, to hold back on thoughts, to avoid debating or expressing knowledge. But I kept training the body and the mind. As I chose journalism as a career, I came to experience a different kind of bullying. I see dictators and their cronies as bullies who, thanks to the powers vested in them by their states, and the people they have come to subjugate, constitute a class of some of the worst criminals in the world. In 1992, while working for the state daily newspaper Jornal de Angola, I investigated the activities of a businessman who was also a Member of Parliament for the ruling party MPLA. He ran a terminal at Luanda’s Port, where he was accustomed to stealing the merchandise from the containers of his clients to stock his own shops and other business ventures. When the photographer working with me went to take pictures of some of the containers which had been diverted by him, as evidence, the businessman, protected by the police, punched my colleague. We ran the story and denounced the assault. The businessman immediately dispatched his brother, a three-star general, to the newsroom to strike fear into us and have the story disavowed. He did not succeed. However, unbeknown to the newsroom there was a conversation between the businessman and the newspaper’s director, and that changed everything. According to the revised report, no journalist was ever punched and the businessman was a law-abiding citizen. That newspaper, the Jornal de Angola, remains the only nationwide daily newspaper, and nowadays, it seems its sole purpose is to defend the corrupt. This is how bullies in power behave when they fail to silence all quarters of dissent. They use laws – but only when it suits them – as a tool for self-protection, or to strengthen their claims to political legitimacy and international respectability. For instance, in 1997, I wrote an article for a weekly independent newspaper, Folha 8, about the discriminatory military conscription of the poor and powerless for the renewed war effort. For the first time I was called in for questioning by the police. I had written about the poor mothers who had been turned into mass-producers of “cannon fodder”. So the investigators threatened me by asking me if I wanted to become a martyr. We all know what that means. I deliberately wrote in such a way that I could not be accused of defamation nor of a crime against State Security. Nevertheless, the judicial apparatus was summoned to deliver the threats. It backfired. All the shouting and the table-thumping only strengthened my resolve. That year, being interrogated by the police became a badge of honor for journalists crafting space for independent media in Angola. It came as no surprise when that anonymous shadowy figure of authority, which in Angola we call “superior orders”, had the book removed from the shelves of Luanda’s main bookstore. It was deemed subversive. This was not about the actual content, but a heavy-handed attempt to intimidate into silence the author with ideas contrary to the status quo. A prosecutor covers her face with a wig giving a new style to the Angolan justice system. In 1999, I became closely acquainted with criminal defamation. I was in a personal tug-of-war with another writer and Member of Parliament for the ruling MPLA, João Melo, exchanging op-eds from opposite points of view about the country’s political and military situation. In a final rejoinder to him – “The Lipstick of Dictatorship” – I called the president a corrupt leader and a dictator. I was arrested for that. After 40 days in preventative detention, 11 of which held incommunicado, I was only charged on the day of my release and the charge was for the crime of defaming the dictator. By the way, I was initially locked up as a prisoner of war. Needless to say, I was sentenced to six months in prison by a kangaroo court that did not allow me my legal right to present any evidence against the president. In 2002, a number of international organizations took up my case, reporting it to the United Nations Human Rights Committee (UNHRC). In 2005, it ruled that my imprisonment was illegal, and my conviction did not follow due process. The UNHRC urged the government of Angola to pay me compensation for the damages. The government responded that the United Nations had no authority to intervene in this matter. Two years later, in 2007 that same Angolan government was elected as a member of the rebranded United Nations Human Rights Council (UNHRC). And went on bragging about this at home as a triumph of Angolan diplomacy. Today, it is happy to hold a non-permanent seat on the Security Council of the United Nations. Such is the world. My arrest and trial drew such intense national and international pressure that it led to campaigns to repeal the infamous article 46 of the Media Law on criminal defamation. This was the article which did not allow any evidence against the president to be presented. A new media law was passed in 2006, scrapping article 46. The new law no longer mentions defamation or slander but refers to the Penal Code and other legislation in which defamation remains criminalized. Let me tell you how they use the law on criminal defamation as a form of political harassment against those the government feels it can take down without jeopardizing its tight grip on power. One of Angola’s foremost journalists, William Tonet, has a significant constituency. And he has harnessed his support to master the art of bullying back the authorities. Over the years, the journalist, who owns the weekly newspaper Folha 8, has collected more than 90 summons for defamation and slander of members of the regime. On October 10, 2011 the Luanda Provincial Court convicted him on charges of defamation against the two most powerful generals in the country, the Minister of State and the head of the President’s Security Bureau, General Manuel Hélder Vieira Dias “Kopelipa”, and the head of Military Intelligence, General José Maria. In addition to a one year suspended prison term, the court also sentenced Mr Tonet to pay US $105,000 in compensation to the generals. Proof of William Tonet’s popularity came quickly: some 23,500 people contributed more than 71,000 US dollars in the space of just one week, to express their solidarity with him and their outrage against the judicial system and the generals. The court refused to accept the payment out of fear of a snowball effect of solidarity against the regime. In 2013, Angola witnessed a number of examples of the use of legislation as a weapon against freedom of expression, and its enforcement through violence and illegal methods. 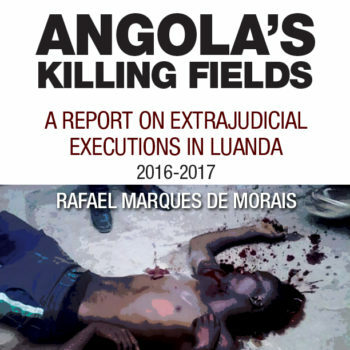 This same year also showed that there is no rule of law in Angola, but only the veneer of it. First, Domingos da Cruz, a writer, journalist and university lecturer, was put on trial accused of inciting civil disobedience because of a text he published, and later turned into a book, accusing the president of being a tyrant who is corrupt and insensitive to people’s suffering. For this he was also charged with public disorder. There was just one problem with this: the crime of inciting civil disobedience did not exist in the legal framework. Two years later, Domingos da Cruz would be charged with plotting a rebellion and a conspiracy to assassinate the president based on his most recent writing, as I will explain in a moment. Then, a 17 year-old activist, Nito Alves was seized by state security and police forces for ordering the printing of 20 t-shirts with a slogan that called President José Eduardo dos Santos a “disgusting dictator.” Luckily for him, a witness called a local radio station to say he had been kidnapped. As a result of the ensuing public outcry the authorities had to acknowledge he was in official custody. But charges were only laid two months later, after much pressure. His crime was: “the crime of outrage and insulting the head of state”. His case finally came to trial one year later amid a protest outside the court of people chanting “Down with the Dictator”, in spite of the heavy police presence deployed as security. This evidence of pro-active solidarity, seems once again to have led the authorities to dismiss what were ridiculous charges and set the young man free. But, he was now at the head of a watch list, and it would be only a matter of time before he was arrested and subjected to torture, over and over, before the June 2015 events that saw him locked up for six months in preventative detention. He is currently back behind bars when the judge in the latest show trial against him, sentenced him to six months for contempt of the court. The grounds for contempt were these: Nito Alves simply said out loud that his trial – the Case of the Luanda Book Club – was a farce that he did not fear for his life. That was it. He is in jail now for being outspoken. But going back to 2013, in that one year three journalists, Alexandre Solombe, Coque Mukuta, and myself, were arrested while interviewing seven activists who had just been released on bail by the court. The Rapid Intervention Police had a camerawoman filming as they humiliated us at their garrison. Their commander personally stomped on my back with his boots as the camerawoman kept filming. When we were released, Solombe and I lodged a criminal complaint for illegal arrest and assault. The Office of the Attorney General simply ignored that complaint, a clear sign that it exists only as an enforcer for the regime. That same year, the Attorney-General’s office had me interrogated for the alleged defamation of nine generals. As it could not sustain the case of defamation, even by trampling on the laws, in 2014 it formally charged me with malicious denunciation. Needless to say that, in 2015, I was convicted and sentenced to six months in prison, suspended for one year. My crime, was to write a book exposing corruption and consequent human rights abuses by companies co-owned by nine army generals. The book was published in Portugal, in 2011, and it was there that the generals had initially lodged a criminal complaint for defamation. That complaint was dismissed by the public prosecutor’s office who ruled that the investigation documented in the book was rigorous and backed up by facts, and in the public interest. Nonetheless, when it came to the Angolan court case, which some have described as a “kangaroo court”, the judge imposed on me, as a condition not to incarcerate me that I recall the copies of the book, and take down all references to it from the Internet. As I am not to be bullied again, I went right ahead and had the Italian translation of the book published in Italy. The Luanda Book Club defendants on the first day of their trial. As we are here, among writers and journalists, let me share with you the story of the 15 young men arrested last June, while discussing a book on non-violent methods of transitioning from dictatorship to democracy. They were meeting at a bookstore in Luanda – the Livraria Kiazele. One of them is the writer Domingos da Cruz, whom I mentioned earlier. He wrote an adaption of Gene Sharp’s book From Dictatorship to Democracy: A Conceptual Framework for Liberation to empower some youth groups to exercise their constitutional rights to hold peaceful protests. Another journalist, Sedrick de Carvalho, who designed the layout of Domingos da Cruz’ democracy manual, was also amongst those arrested and detained. You will not be surprised to hear that Nito Alves, was another. They have all been charged with plotting a rebellion with the intent to assassinate the president… with their ideas. In December, they were released from prison and placed under house arrest, with 150 police and security officers deployed to enforce their confinement, 10 for each of them. That’s how dangerous ideas can be. There are many creative ways for regimes to abuse the legal system to politically persecute and prosecute those on the watch list. When it came to the Luanda Book Club, many of the harshest critics of the regime could be gathered up all in one fell swoop. On my way to the airport en route to this meeting, I picked up the March 6 edition of the state daily newspaper Jornal de Angola. On page 28, there was an edict from the Luanda Provincial Court summoning William Tonet, the brave journalist whom I mentioned earlier, and myself among others, to a court hearing on March 7 in connection with the Luanda Book Club Case. Supposedly, William and I were named as members of a purported government of national salvation that would take over once the young people smoked the president out the palace. Try not to laugh. Yes, the charges specify that the youth would march to the presidential palace, and would burn tires to smoke the incumbent José Eduardo dos Santos out of there. How do we defend ourselves against a social media joke, which the government is doggedly using to frame the 15? Already we are into the fourth month, and so far the prosecution has produced no concrete evidence to substantiate the charges. As the house arrest measure must be reviewed every two months, recently the judge, without any explanation, ruled that the group continues to pose a threat to public order and might cause disturbance. However, according to the Law on Precautionary Measures in the Penal Process, he is obliged to specify why each individual might be a threat. His failure to do so, according to law professor Rui Verde, renders the ruling illegal and unconstitutional for violating articles 18, 19 and 39 of such law. The strategy of keeping them in jail caused an outpouring of international solidarity. Has that solidarity waned? Is the regime hoping for compassion fatigue? Meanwhile, Nito Alves is back in jail for a trifle. On March 7, Judge Januário Domingos also sent back to jail university lecturer, Nuno Álvaro Dala, one of the 15 defendants. Mr Dala refused to appear before the court as he is ill and has been denied treatment while under house arrest. Who is next? As I have shared some personal stories with you, I should clarify that nowadays I do own some proper gym equipment. I bought it at the end of 1999, when I left jail, to regain the weight I had lost after 14 days in hunger strike, and it is like new. To be frank, it is my son who uses it, when it’s not being used as a spare clothes rack. Today, the effort I once put into weightlifting is put instead into creating networks of solidarity and friendship. One of the most poignant stories that reached my ears recently was about a teacher I had helped many years ago, by exposing a corruption scam that had deprived him of his salary for three years. One day he saw a newspaper in his village with a picture of me, and learnt that I was on trial. He traded the big fish he was planning for his supper, to buy that newspaper, by way of demonstrating how much he valued my work. Legal reforms are important. But in cases like Angola, where we have an insensitive kleptocrat installed in power for 36 years. His deeds and those of his cronies in systematically abusing human rights and plundering the country, effectively rules out any possibility that they would honestly allow the rule of law in the country. They believe in a culture of impunity, and history shows that they will commit more crimes in the attempt to protect themselves from being prosecuted. So the imperative is that those of goodwill and strength of character in Angola do what the government fears the most: to conquer the space for freedom of expression for all citizens. It is about mustering a force within society that coalesces to defend freedom of expression and, in doing so, beats back the bullies with the power of the truth. There lies the most solid foundation for participatory democracy ultimately to guarantee the building of strong institutions to protect the rights enshrined in the constitution. *Paper presented at the PEN International Meeting in Johannesburg, South Africa, 7-9 March 2016.